This indicator depends on the variety of ways which Casino Estrella offers his clients to contact customer support and the speed with which it solves a problem, as also the overall customer experience. 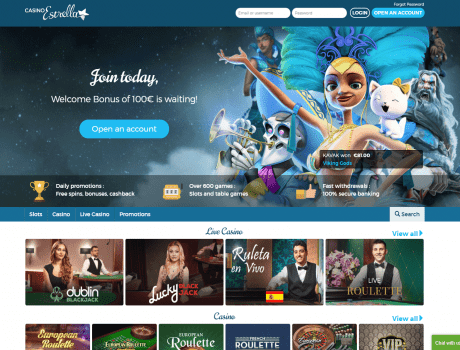 The reputation rating of Casino Estrella is based on its popularity in online space - comments, user ratings on other sites, and social networking likes. Join Casino Estrella every Monday for our Slot of the Week, where you can grab up to 100 free spins on one of our top slot games! What do you have to do? Simple! Make one of the following deposit amounts, and then get to spinning. Deposit €20-49: 15 Free Spins, deposit €50-99: 40 Free Spins, deposit €100+: 100 Free Spins! The free spins are activated by a deposit of €20 or more. Free spins are credited on your very next login. If the Slot of the Week is not available in your country, the free spins will be credited on another game. Winnings generated from free spins must be wagered 30 times. Free spins will be forfeited if not used within 3 days.